Some literature compares a dairy cow to a factory. That means what is fed to the cow determines to a large extent the quality and quantity of milk produced. When a cow gets sick and is unable to feed well, its energy levels go down. The cow’s first response will be to cut down milk production to save energy for its wellbeing. If energy levels remain low, the cow will not show any signs of heat. This shows that production and reproduction are the two most affected when a cow is not fed with the right quality and quantities of feed. It is, therefore, important that a farmer knows the nutritional requirements of a dairy cow to provide adequate rations to meet it production and reproductive requirements. 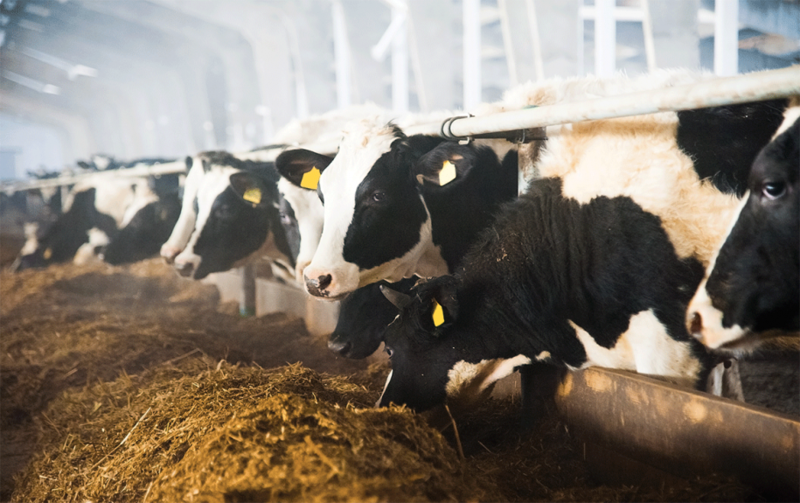 For a healthy and productive cow, feed rations should have a balance of quantity, quality, amounts of concentrates, protein, mineral and vitamins. Fodder/roughages are bulky feeds that are rich in energy and proteins, but are not whole meal. They are important for high milk production in dairy cows and constitute up to 80 per cent of the diet. Example of fodder includes napier grass, Boma Rhodes, lucerne, desmodium and sweet potatoes vines. Napier grass is best intercropped with desmodium, harvested and fed together. Fresh fodder should be fed after a day’s wilt, chopped into 2 inch pieces to enable the cow feed easily and minimise wastage. A dairy cow should consume 15-20kg of chopped forage per day preferably in two splits, one in the morning and the other in the evening. A dairy cow may be steamed up by providing good quality hay, dairy meal concentrate 1-2kg per cow per day and Intromin mineral block supplement free choice. After calving, a dairy cow should be fed 3kg of concentrates (dairy meal) per day depending on individual production. The animals may be challenged further by increasing their dairy meal rations for up to an optimal level. Dairy meal should be fed after milking so that the cow remains standing until the teat canal closes. This helps to avoid teat infection and mastitis. Yeast fed to a dairy cow improves feed digestibility, increases feed intake and overall performance and productivity. As more organic matter is fermented per unit time, the animal is able to consume more dry matter which also increases net energy. As the number of beneficial bacteria increases, there is subsequent increase in microbial protein, which when combined with increased net energy leads to high milk production. Chachu is a well-balanced combination of yeast, vitamins, organic acids and minerals. Mineral supplements should be provided as they are essential in milk production, they improve fertility, reduce incidences of retained placenta and also contributes to development of strong bones in the growing foetus. Granular mineral salts should be mixed with feeds in a feeding trough or fed with the concentrates. It may be necessary to moisten the granular mineral licks to prevent dusting during licking as this predisposes the cows to respiratory problems. Provide mineral salts at a rate of 150g for every 5 litres of milk produced, and an extra 60g for every 5 extra litres. A Mineral block should be availed at all times. Wholesome drinking water must be available all the time.